Putin & Erdogan agree Idlib buffer zone to avert new Syria crisis - OΛΑ ΘΕΣΣΑΛΟΝΙΚΗ !!! Putin & Erdogan agree Idlib buffer zone to avert new Syria crisis | OΛΑ ΘΕΣΣΑΛΟΝΙΚΗ !!! Russia and Turkey have agreed a “demilitarized zone” between militants and government troops in Syria’s Idlib, President Vladimir Putin said after hours-long talks with Turkey’s Recep Tayyip Erdogan focused on solving the crisis. “We’ve focused on the situation in the province of Idlib, considering presence of large militant groups and their infrastructure there,” Putin said at a press conference after the talks. As part of solving the deadlock, all heavy weaponry, including tanks and artillery, will be withdrawn from the zone before October 10, Putin said. The zone will be patrolled by Turkish and Russian military units. The agreement has received “general support” from the Syrian government, according to Putin. The deal and other issues of Russian-Turkish ties apparently took almost 5 hours to hammer out. 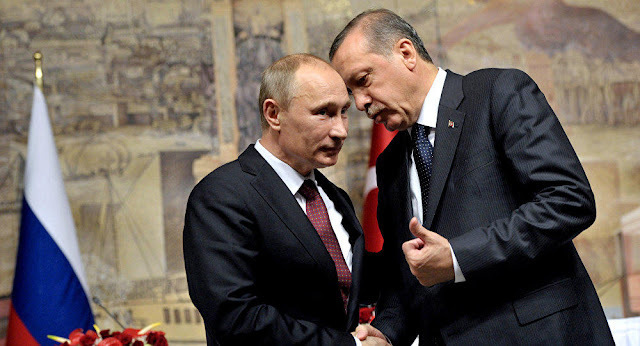 In what appears to a breakthrough solution, Putin and Erdogan have agreed to ensure peace with the help of Russian and Turkish troops. “The territory controlled by the Syrian opposition must be demilitarized and the Syrian opposition that is holding these territories will remain there. But together with Russia we will make efforts to clear these territories of radical elements,” Erdogan said. The agreement is designed to prevent a new “humanitarian crisis” in Syria, Erdogan stressed, and will help Turkey to avoid an even more “difficult situation.” He had previously warned of a surge in refugees hitting the country should a full-blown war break out in Idlib.